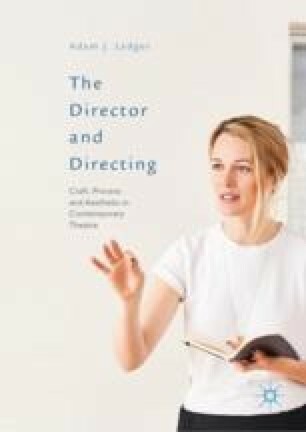 This chapter determines that since most of the director’s work takes place in rehearsal, this often neglected aspect academically is thus fundamental to an examination of directing. The discussion assesses how the director can be positioned in relation to rehearsal, in which she/he seeks ‘situational constancy’ (Zeki). Rehearsal observation is assessed in terms of a critical positionality and unfolds through discussion of Riotous Company, productions by Katie Mitchell, the Steppenwolf Theatre Company, Carrie Cracknell’s work at the National Theatre, and two productions by Ivo van Hove. Directing is argued as the pursuit of what G. Gabrielle Starr determines ‘reward’, as well as knowledge. Elements of directing and acting are couched in creative theory and neuroaesthetic terms, including the playing of intentions as a concept (Zeki), and the body is a percept amid a theatrical ‘totality’ (van Hove). Rehearsal is thus seen as simultaneously a practise and practice.